IDEAL FOR FUNERAL BALLOONS FOR RELEASE OR TO ADORN SYMPATHY GIFTS: To an sorrowful occasion, our balloons signify love and remembrance. They tell a story of celebration and commemoration. "Those we love Don't go away. They walk beside us Everyday." ~Ideal for balloon releases or to adorn flowers arrangements. "Until we meet Again"~ Says the Unspoken. Love is more powerful than death. Silver contrasts the White Color. "Love"~ Plain embodiment of what is left. Silver contrasts the White Color. Variety Pack~ Beautifully decorates funeral gathering areas in subtle and classy way. MEANINGFUL: Our balloons symbolize the light amongst the sorrow. We aim to celebrate the life of a beautiful sole. As the balloons drift into space, they carry away sorrow, return peace, and allow for reflection. At the moment balloons are released, there is no control. This memorable event reminds us that like balloon releases, life and loss is not within our control. BIODEGRADABLE: High quality biodegradable latex. Decomposes in the time an oak leaf to decomposes. Our balloons are constructed to preserve helium, though compatible with both helium and plain air inflation. PURPOSE: Our balloons are ideally used to adorn a simple flower arrangement, or for balloon releases during funerals, ash scatterings, and anniversary of the loved one's passing. CUSTOMER SATISFACTION GUARANTEED: AMERIBA lives by the ideals that that our customers pay our employees' wages. Your satisfaction is our priority. IF YOU LIKE OUR PRODUCT AND PRICE, HELP US KEEP THE PRICE LOW. GIVE US A SHOUTOUT & WRITE A REVIEW! ✅ COMMEMORATE THE LIFE - Our 12" x 30" Round White and Silver Balloons commemorate the soul. They add some lightness to the memorial by directing your gaze upwards. They remind you that your Loved One is at peace. They convey remembrance, hope, and love and help celebrate the Life of your Loved One in a unique and joyous way. As the balloons float away, they represent the lifting away of grief and replacing it with light and love. 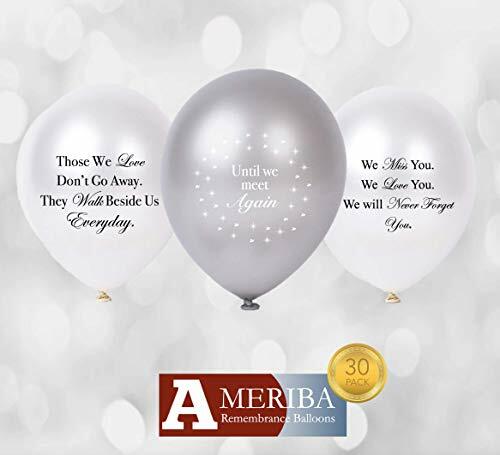 ✅ IDEAL FOR BALLOON RELEASES - Our balloons are most ideal for funeral releases, memorial events, anniversaries of passing, and ash scatterings of your Loved Ones. They add a personal warmth when adorning a simple flower arrangement or when filled with helium for a balloon release. When balloons are released during these events, they bring a lightness and hope to the occasion. They remind everyone the story is not over. ✅ HIGHLY VERSATILE OPTIONS - Our balloons come in meaningful options: (1) "We miss you. We love you. We will never forget you. ~Ideal for balloon releases for the grieving. (2) "Those we love Don't go away. They walk beside us Everyday." ~Ideal for balloon releases or to adorn flowers arrangements. (3) "Love"~ The plain embodiment of what is left. (4) Until We Meet Again~ The light at the end of the tunnel. Beautifully decorates funeral gathering areas in subtle and classy way. ✅EASY TO USE - Our balloons stay inflated through basic air inflation for weeks. When using helium, it is best to inflate the balloons on the day of the event. Inflation time is 8 hours on average. Balloon Time Helium Tank (about $25) is easy to use and found at any superstore. When using Hi-Float with helium, the balloons can stay inflated for a few days. If inflating just a few balloons at a time, you local party story can do the trick! ✅ BIODEGRADABLE - 100% Biodegradable. Our balloons decompose in the same amount of time it takes an Oak Leaf. Remember to cut the strings off to avoid hurting any animals. Thank you. If you have any questions about this product by AMERIBA, contact us by completing and submitting the form below. If you are looking for a specif part number, please include it with your message.